Feed special paper strips into this hand-cranked "box" to hear old-fashioned melodies. Whether we're singing out loud, tinkering with instruments, or simply humming along to the tunes of nature, we simply crave melody. That's why musical instruments have been around since people can remember, and mechanical music boxes since we've, well, mastered mechanics. The Mechanical Music Box Set is a unique variation on the old classic. 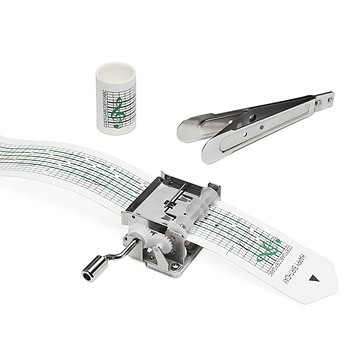 Holes punched into special paper strips are fed into a hand-cranked "box," which produces tones quite unlike those of any other musical instrument. Makes a great gift for budding and professional musicians alike. Comes with three blank paper strips, a hole puncher, an instruction manual, and a pre-punched "Happy Birthday" song strip. Great fun little toy which allows the children to be creative and imaginative while using their note-reading skills. Perfect for that scientific kind a person! I bought this for my sweet husband of 20+ years. We have a hard time getting each others something now but this fit the bill. I bought it for an 11 year old who is in band and his 13 year old sister used it first. Her creation sounded beautiful. The music box allows him to write his own music and he did do that! Xmas gift for my brother. Cute, fun, and really pleasant music! The whole family had a great time playing with this! Even my young niece and nephew were able to turn the crank with some help. The sound is great. This is a perfect gift for a musician or music-lover who has everything and likes to tinker! I bought this for my niece who is 9 years old. On the second day the cranks inside broke. I don't believe she was mishandling this or being ruff with it. She was using it as designed.